With a reduced budget, we need to find a way to save money for our pool. Lincoln Aquatics offers the DuraMax® Duo automatic vacuum cleaner. An automatic pool vacuum cleans your pool and reduces the time required to do the work. Vacuums are available for every size pool and budget. An automatic vacuum is one of the most cost-efficient purchases you can make. The return on your investment is usually less than one year. DuMor Site Furnishings now offers EarthPlanter premium self-watering inserts as an option or retrofit for a large selection of its planters. The EarthPlanter system is the perfect solution for any commercial environment. How can we protect our facility and patrons from disease? Protect your facility and patrons against MRSA, H1N1 and HIV with the lowest-priced EPA formula available. Revolution Wipes safely sanitizes all fitness equipment surfaces. The fast-acting formula kills pathogens on contact and is an effective virucidal and fungicidal. Tested and approved by leading equipment manufacturers, the ever-evolving GymWipes product line offers a great value. Bad weather has an impact on our tennis programs. Joey Molina is the head tennis professional at Rockwall Golf & Athletic Club and has been the tennis director for two years. The tennis programs, clinics and lessons can be at the mercy of inclement weather. Molina found ClearSpan Fabric Structures and ultimately chose a 120-by-120-foot indoor athletic facility due to its cost-effectiveness and appeal. "Now that we have two of our courts covered, we can remain active when it rains," Molina said. We need to provide outdoor tables for some public spaces, but don't have much room. 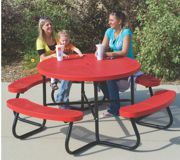 Round picnic tables are a perfect site complement for patios, lobbies, streetscapes and other common areas. Round tables require a smaller space, so they fit almost anywhere but can easily seat people. These tables are built to withstand public outdoor use. Colorful thermoplastic coated steel tops and seats are impervious to the weather and the surfaces dry quickly. How can we control water runoff on our open-air structure? The PoliGuard™ rain gutter system combines the highest quality finish available with exceptional strength and durability to provide your shelter with the best-looking, longest-lasting rain gutter system available. Fabricated of steel with a low profile, this gutter system is visually unobtrusive and a top choice of professionals where robust duty is required. We want to offer shade at our pool, but don't want to damage the pool deck with concrete footings. Look no further than Shade Systems' Café Umbrellas, the portable and collapsible shading solution that doesn't require a concrete footer or expensive installation cost. Ideal for pools and concessions, Café Umbrellas come in a variety of shapes and sizes and feature the support post offset to one side to allow plenty of room to arrange chaises or tables and chairs underneath. Our swings and chains are looking worn and rusty. Regular maintenance is the key to playground safety. 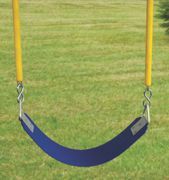 No need to replace the entire swing set when you can find all the commercial-grade replacement parts at SwingSetMall.com. Belt Swings and Bucket Swings with a variety of chain, fasteners and swing hanger options—all at affordable prices with free shipping on orders $99 and up.